Have you ever read about what bears do in the fall? They gorge themselves to put on more weight, which will insulate them during the cold winter months and provide nutrients during their hibernation. They are prompted both by the colder temperatures and also by the shortening days. The longer hours of darkness cue the bears’ internal clocks to begin the process of getting ready to hibernate. Unfortunately, humans’ internal clocks have not yet evolved from doing something similar. 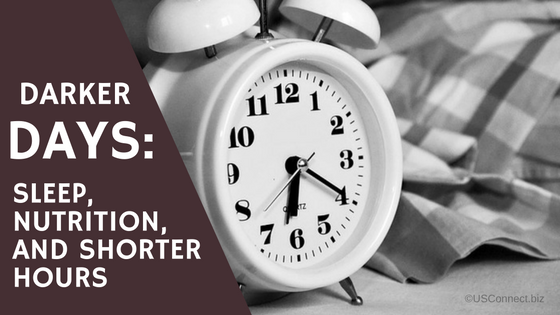 As the hours of daylight get shorter, our bodies want to pack on the pounds and get ready for hibernation. That’s why in the fall and winter, it’s more important than ever to pay attention to your eating and sleeping habits. The lack of daylight during the fall and winter hours leads to a lack of serotonin, which regulates mood and food cravings. To buck your body’s desire to hibernate, trick it into thinking that the days aren’t really getting shorter by making sure to take as much time outside in the sunshine as possible. If sunlight is truly unavailable, try using a light therapy box—recommended for the seasonal affective disorder (SAD) that affects up to six percent of the population during the winter. You can also resist your body’s desire to hibernate by making sure to get plenty of sleep at night. When we’re overtired, we’re likely to eat more to keep ourselves going through the day. Getting more sleep at night might mean cutting down on screen time before bed; studies have shown that the blue light from tablet and phone screens is especially damaging to sleep because it suppresses the production of melatonin, which regulates sleep. Another good way to stay healthy during the winter is to eat more protein throughout the day, especially for breakfast. We often crave carbohydrates for comfort, but starchy foods are more likely to make us want to sleep rather than giving us energy to work. Make sure your breakfast and lunch include protein, like turkey or tofu, sausage or eggs, to keep you going at work. And read more here about healthy winter eating tips from our nutrition program, The Right Choice … for a Healthier You™. Micro markets are all the rage in the vending industry. They take up an increasing share of vending revenue and are responsible for much of the vending industry’s success in 2015. But have you ever wondered what, exactly, a micro market is? 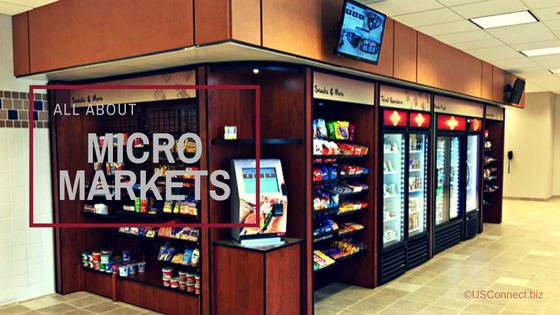 Industry group Vending How describes a micro market as “a small, self-contained store in a location without an employee to monitor it.” It’s comprised of freestanding storage, such as shelves, that hold a product and a checkout system installed nearby. Micro markets offer more choice than traditional vending machines, particularly in the realm of fresh food. However, unlike an actual convenience store, they don’t need to be staffed, and they have a much smaller footprint, making them very cost-efficient. The National Automatic Merchandising Association (NAMA) cautions that while it’s fine to emphasize the convenience of micro markets, operators should refrain from comparing them to convenience stores. Full-service convenience stores tend to offer a larger variety of choices, but they are often limited in terms of offering local choices. Micro markets can capitalize on their small size by buying from local and regional food producers. As we’ve discussed, three of the biggest trends in foodservice are fresh, local, and convenient. Micro markets can respond to all three of these trends with more agility than any fast-food restaurant or convenience store. USConnect’s Bistro To Go!® micro markets and The Right Choice … for a Healthier You™ program combine convenience, freshness, and health all in one place.